Amtrak! It's generally cheaper than flying. It'll generally never make you take off your shoes. But more importantly, it has a cafe car you can visit whenever you damn well please. Nope, there's no "seat belt" light that tells you when you can and cannot move about the train (towards the cafe car!). Also, there are no seat belts. But what should you do with this freedom? You should eat, of course, because your phone battery is about to die from looking at your ex's Instagram, you're tired of all your Spotify playlists, and you're hungry, dammit. But what should you eat?! This guide should help. A couple of programming notes: this only applies to the items offered in the standard cafe car, not the more robust dining cars (that sometimes require reservations!). Also, this is focused on items that are either specific to the train or at the very least prepared in some fashion. You don't need me to tell you whether or not you should eat some Doritos. If you feel like Doritos (or a Snickers, or a KIND bar), you should eat some. Got it? Good. On with the foods! Wow. Where to start with this one. The layers of sticker-clad plastic it comes in were extremely difficult to pry open, which was alarming given the clearly questionable cheesy liquid inside just waiting for me to enjoy (?) it. 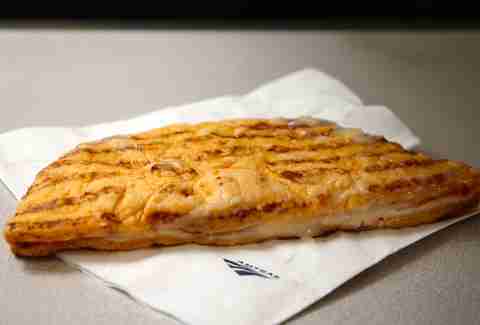 Once freed, I had before me a "panini" that looked more like a burnt orange quesadilla someone painted grill marks on. 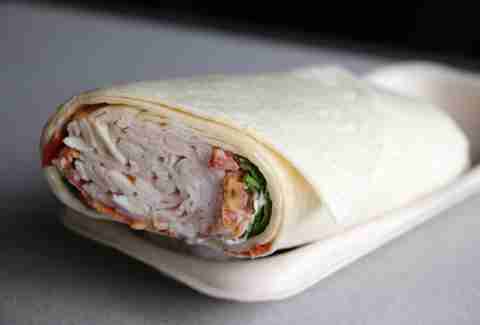 The innards were a runny mess punctuated by slices of what must have been chicken, an occasional tomato (why not?! ), and little to no discernible Buffalo-ness (is that why the flatbread is orange?). Look, no one's expecting a train to be whimsically firing up a panini press. You shot too high with this one, Amtrak. Keep it simple. So, that burger up there looks pretty good, right? DO NOT BE FOOLED. Honestly making it look like that might be the greatest photographic accomplishment of my lifetime. The bun's a watery mess with little to no structural integrity left, the "Angus" is acrid and crumbly and altogether off-putting, and the cheese is... definitely orange. Even by the low expectations I harbor for a microwaved cheeseburger (which I am not ashamed to say I've enjoyed in my lifetime), this was rough. This is not to praise the veggie burger. This is to emphasize how strongly I suggest you avoid the other burger. 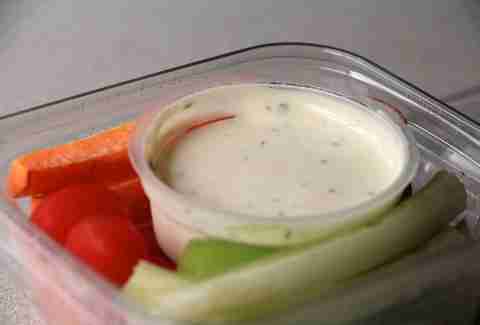 Crudite! How fancy! Is this an episode of Downton Abbey? Nope, it's just a pack of Buffalo wing sidekick-level celery, carrot sticks that've seen better days, a tomato, and some legit scary-looking radish shards, all wrapped around an alarmingly large cup of ranch given the proportion of veggies involved. That's not a knock on Amtrak -- it's just frightening to know that there are many Americans capable of using it all up with the meager vegetable matter at hand. Do they use the rest of the ranch as a chaser? Probably. It's not delivery. It's also markedly better out of an oven than a microwave. Okay, so this pasta wasn't exactly something that would wow Scott Conant on Chopped, but I've certainly experienced worse when it comes to pre-packaged pasta salads. The balls of "fresh" mozzarella were kind of gummy and off-putting, but certainly not horrifying, and the cherry tomatoes were bright and reasonably fresh. 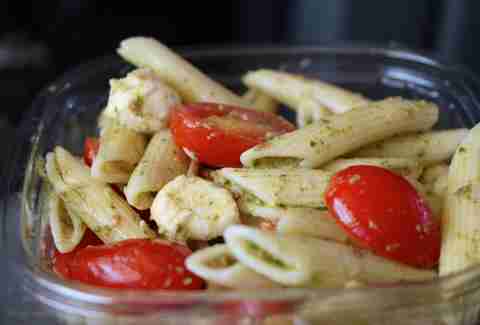 Probably don't save this as a present for your Italian grandmother who you don't visit enough, but it'll do if pasta salad on a train is a thing you feel like eating. Not exactly life altering, but no egregious issues, and a pleasant dressing on the side that allows you to customize your salad in varieties from "healthy-ish" to "you have negated any benefit of ordering this salad." Tightly wrapped (in more ways than one -- this was yet another packaging struggle) in a fresh enough-tasting flour tortilla... this guy wasn't bad, but to be honest I had higher hopes. Usually a robust concentration of meat (as opposed to like, a bunch of lettuce filler) would be a good thing, but this was just a compact wad of deli turkey with barely even a hint of lettuce or tomato (and an even less detectable bacon presence, which was borderline devastating). You don't mind having it around, but you're probably going to be eyeing something better. It is the Luke Ridnour of menu items. Microwave or no, not half bad! The hot dog might be America's most impossible food to completely ruin. Though, I'm usually that guy who takes the crazy-charred dog off the grill that got so black everyone forgot it was there as it blended into the grates, so maybe I'm the wrong person to ask. This high ranking could be partly a product of low expectations borne out of past fruit cup disappointments, but damn if this wasn't tasty! All the fruit was legitimately fresh, and while the slightly disappointing dominance of the less-than-dynamic duo of honeydew and cantaloupe that has become all too familiar in the fruit salad world certainly held true, there were just enough lush strawberries (ah, the bounty of summer!) and red grapes to make the overall product sing. 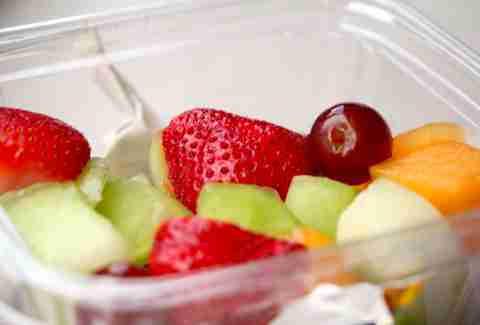 It wasn't like that hotel "fresh fruit bowl" that runs you $15 for a heap of sad honeydew and the faint suggestion of a strawberry in there somewhere. Definitely the best argument for avoiding the microwave. All the ingredients (turkey, Swiss, lettuce, tomato & mayo) were nicely proportioned and the multigrain roll (it's healthy because you can see oats on it!) had a pleasant texture once it warmed up a bit from stepping out of the refrigerator. Like Samwise Gamgee, a reliable if understated travel companion. Hero, indeed. So, this thing was particularly challenging to free from its plastic prison, but once it was out it really made its porky presence felt. I was hesitant to let it hit the microwave after previous microwave experiences, but kind worker suggested it was best served warm, while kindly declining to suggest I might have food addiction issues after working my way through the entire menu in a scant hour. 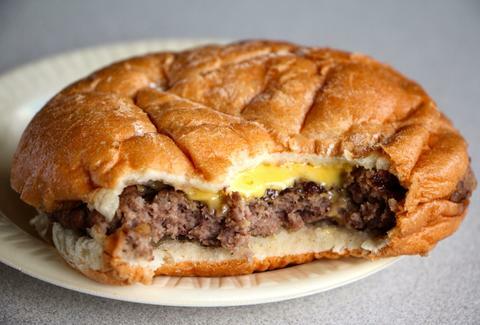 The preztel bun held its integrity impressively well -- a little spongy, but far from unpleasant. The tangy cheddar flavor was actually recognizable. 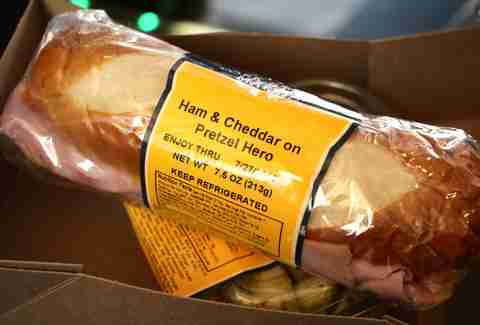 The ham was thinly sliced and delightfully ham-like, and the restrained hint of Dijon provided just the right zing. 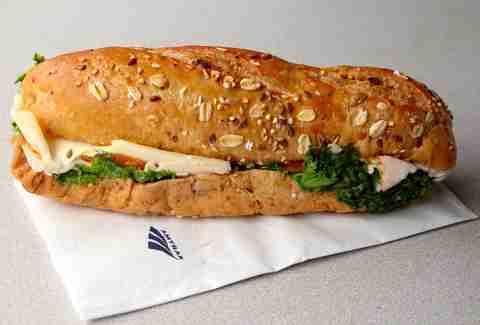 Assuming activities like eating pork, combining said pork with cheese, and surrounding the aforementioned pork and cheese with carbs aren't against any of your religious our health concerns, this should absolutely be your top edible Amtrak companion. Deputy Editor Matt Lynch endured many strange looks as a result of the volume of food he was purchasing. photographing, consuming, and giving away. Talk to him about ham: @MLynchChi.